Iranian filmmaker Asghar Farhadi has been prominent in the entertainment headlines lately for his refusal to attend the recent Academy Awards, where his latest film The Salesman was up for the Best Foreign Language Film Oscar (which it just won; incidentally, congratulations Mr. Farhadi!). Of course, this was in protest to Donald Trump’s travel ban on Muslim internationals, including those from Iran, and Farhadi’s boycott was in solidarity with the numerous amount of people who were being denied an opportunity to visit the United States because of outdated and dangerous prejudice. While that alone is a fine reason to go along and see The Salesman as a way to support this guy’s work as well as many other creative types that are being persecuted purely based on their race and religion, you should go and see it anyway because it really is a great movie. The film is about an Iranian couple, Emad (Shahab Hosseini) and Rana (Taraneh Alidoosti), who are also part of an amateur acting troupe, currently in the midst of their local production of Arthur Miller’s Death of a Salesman. When local building work forces them to move out of their apartment, they soon find another location seemingly abandoned by its previous tenant, who is implied to have been a prostitute. They soon settle in and start afresh, only for Rana to suddenly be attacked by an unknown assailant who mistakes her for the previous tenant, and Emad becomes determined to find the attacker and exact revenge, as cracks start to form in his and Rana’s relationship. Farhadi, as with his other previous Oscar-winning film A Separation, really allows us to explore these cracks that ultimately end up pushing this couple further apart, and several themes are brought up in the process such as the one of masculinity – Emad feels shame and dishonour for failing to protect his wife, even though none of it was really his fault – and emotional imprisonment as a result of severe trauma, as when Rana refuses to even go inside the bathroom where she was assaulted, and doesn’t want her husband to leave for work so he can stay and look after her. The inclusion of Miller’s landmark play is no coincidence, nor is the film’s sharing of part of its title; elements from its plot and characters have parallel connotations with the story and people in this film, such as Willy Loman’s own feelings of un-fulfilment and how it eventually tears apart his home, similar to how Emad and Rana drift further away from one another when his own sense of un-fulfilment leads to some dark consequences. Farhadi uses it as mere inspiration for his own drama, and it certainly feels like you’re watching a tense domestic play that stands just as firmly on its own, especially in its surprising second half, but in a way that absolutely holds your attention without demanding it. Praise, too, must go to the film’s two leads who are both perfect in these roles, including Hosseini who brilliantly lets us see his character’s growing insecurity come to a head, while Alidoosti expertly creates a portrait of grief and trauma, including a beautifully acted scene where she breaks down in the middle of a performance. Some will say that the film takes an unwise move by having a drama about a wife’s assault be from the perspective of the husband, but it felt like there was enough fair attention given to both of them to fully explore what is really at the core of this revenge story, and that is of the couple’s deteriorating relationship. Farhadi directs both lead actors, as well as the fine support, with great talent and Hitchcock-style suspense, creating a film that will leave you with plenty of food for thought and an overwhelming desire to support further international talent like this, because if there are filmmakers and artists out there who are the subject of terrible discrimination, then we need to show the world that there is no place for such division, and that everyone is welcome to an artistic vision. In Asghar Farhadi’s case, he is more than welcome. 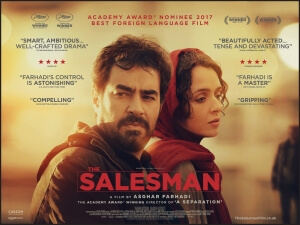 The Salesman is a thoughtful and perfectly tense Iranian drama that uses parallel connotations to Arthur Miller’s Death of a Salesman to create its own mesmerising story of un-fulfilment and broken relationships, along with some great acting and solid direction by Asghar Farhadi who, in the wake of certain political controversies, should not be deterred by opposing forces to fully explore his artistic vision.